makes you smile every time you see it. My ‘thing’ was inspired by my friend Natalie. She created this fabulous family mosaic below. I lusted after it and wanted something similar. But maybe with less work. Okay, with no work if possible. Nat is crafty and patient so naturally her handmade masterpiece was picture perfect. I’m more lazy than crafty and impatient is my middle name (that, and Lynn because weren’t 78% of girls born in 1970 blessed with Lynn as their middle name?). 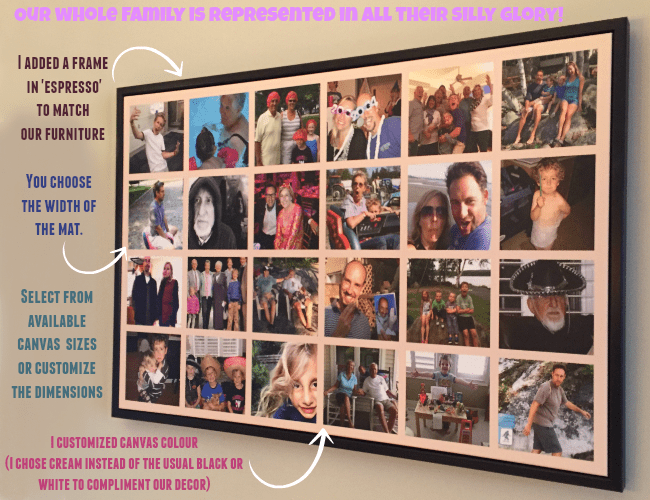 So this ‘Lisa Impatient Lynn’ took a different approach to the family collage. I created my masterpiece online using CanvasPop. The company asked if I’d like to give them a try. I have friends who’ve created gorgeous custom prints with them before so I had already bookmarked this in my brain for a future project. I’ve ordered photos online in the past and it’s a royal pain. That annoying red X that pops up saying my photo is too small to upload? 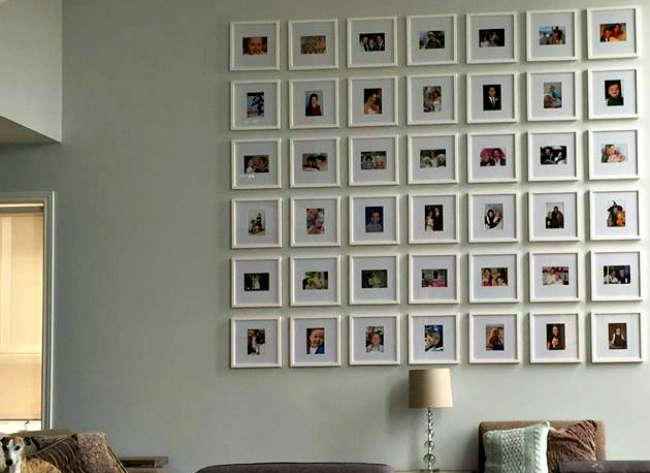 It’s enough to make me bang my head against the wall—the blank wall, where photos would be if I was actually able to order them. Simple—upload photos directly from your computer or Facebook or Instagram. Magic—even if your pictures are low reso, through filters and other photographic mysteries on their end, CanvasPop transforms teeny thumbprints and screenshots into high quality prints, even really big ones. Though CanvasPop offers all kinds of prints—word art, single prints, collages, I knew I wanted a mosaic. (Thanks Natalie for that brainworm.) But instead of traditional pretty family photos—you know the posed pics with perfect smiles and scenic backdrops—I wanted something more “me”. My canvas would be a sampling of ridiculous scenes, unexpected scenarios, candid moments of my family being silly and whacky—the Thornbury and Fraser clans in their *natural state. *Natural state meaning uninhibited, not naked. Never ever naked. The most difficult part of creating a mosaic like this is choosing the photos. Going through my Facebook pictures and iPhotos in search of crazy shots of my family resulted in an astounding number of photos. A lot of gems didn’t make the cut. I’ll have to make another collage or ten to be able to include photos like the one below. This shot, taken from afar, is the forest behind my brother and sister-in-laws’ cottage. A game of manhunt was in full swing and Uncle Julian was missing for over an hour. We finally gave up on finding him. When I zoomed way on this scenic picture after, I spotted him. Hiding. Like a giant child. I laugh out loud whenever I look at it. These are the kinds of photo memories I’m talking about. The ones that make you happy in a laugh out loud kind of way. I also have an awkwardly hilarious photo of my brother with our cat. I’m not allowed to share it. But if you come over, I’ll show you and you’ll pee your pants. I also have a picture of my mom that makes me howl every time I see it. I was warned that if I share that one in public I’ll be grounded. Bottom line: Photos of our most treasured thing—our family—deserve to live in the light. You can absolutely physically create your own collage of your pic picks like Natalie did. 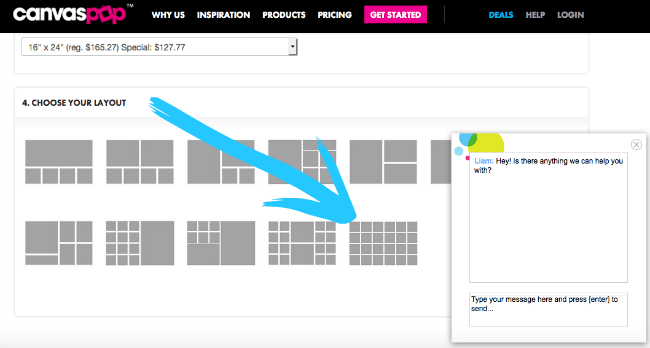 Or, you can made a one of a kind collage in under 30 minutes like I did at CanvasPop. 2. The Mosaic template will only allow you to upload photos from Instagram. I wanted to upload pictures from my computer, so to get around that I created my print using the Collage template and chose the mosaic layout. 3. If you have problems or questions, their customer service is incredible! Liam practically held my hand through the whole process. 5. You can have your creation printed on a stretched canvas with or without a frame (I think the frame makes it look more polished) or you can have it printed on paper, framed, with a plexi-glass cover, with or without a mat. Lots of options. 6. 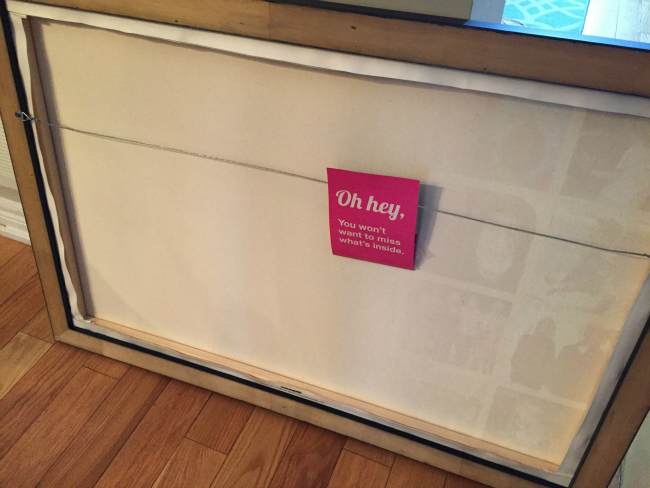 Your high quality (just wait until you see…it’s seriously amazing) print will arrive ready to hang (wire and picture hook included)! Pricing? For the quality, ease and customizability of this art, prices are reasonable ranging (depending on size and framing options) from $50 to $500.